Touring internationally since 2008, Play Me, I’m Yours is an artwork by British artist Luke Jerram. More than 1700 pianos have now been installed in over 55 cities across the globe, from London to Lima, bearing the simple invitation Play Me, I’m Yours. The project has already reached more than ten million people worldwide. Florence, South Carolina presented Play Me, I’m Yours for the third year running, from April 21- May 7 2017, as part of the Willcox, Buyck & Williams Foundation’s history & culture participation program. 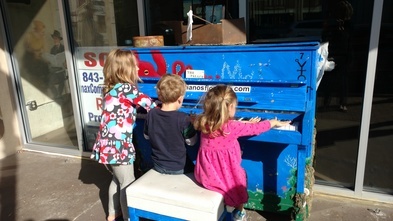 21 Street pianos, decorated by local artists, were located in parks, squares and other public spaces for anyone to play and enjoy. 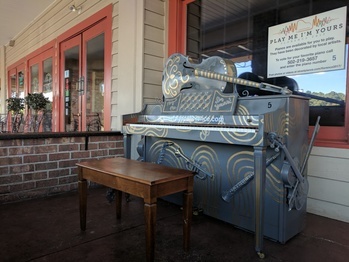 The Most Creative was won by students at East Clarendon Middle School for their Video Games Piano and the People’s Choice was won by the House of Hope piano decorated by Shawn Thompson – Mission Mart Staff. So fun seeing our kids play with the piano! 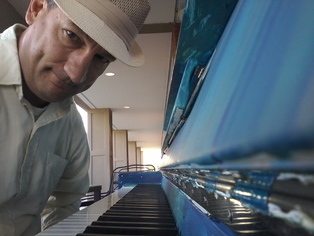 I drove 450 miles for the eclipse and found a piano!